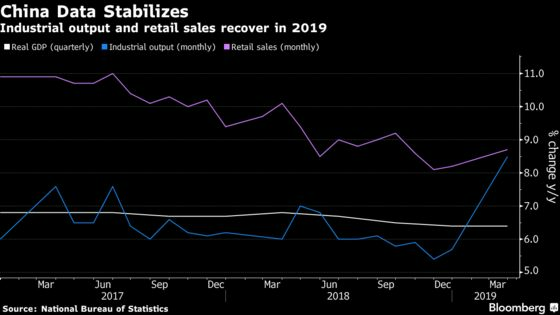 (Bloomberg) -- China’s economy rebounded through the first quarter, a welcome sign of stabilization for the world and handing the government room for maneuver as trade negotiations with the U.S. enter a crucial stage. Gross domestic product rose 6.4 percent in the first three months from a year earlier -- matching last quarter’s pace and beating economists’ estimates. Factory output in March jumped 8.5 percent from a year earlier, much higher than forecast. Retail sales expanded 8.7 percent while investment was up 6.3 percent in the year to date. For a slowing global economy -- on display Wednesday with Germany’s economic ministry cutting its economic growth estimate -- China’s stabilization is a relief. It’s also a sharp reversal from as recently as January when key readings were pointing to a pronounced downturn a factor U.S. officials have touted as leverage in their push for a trade agreement. Car production grew in March for the first time since September, showing manufacturers might be more optimistic after the sales slump last year. The nation’s economic planner is drafting a series of stimulus measures to bolster sales of cars and electronics, according to people familiar with the matter. Aluminum and steel output reached records in the first quarter as producers ramped up operations amid prospects for better demand in the world’s biggest commodities consumer. The reports led some economists to conclude that the data mean policy makers will scale back stimulus measures that had been penciled in for the year. The central bank may be already starting to do that, withdrawing some of the long-term funding it supplies banks on Wednesday.